One of KeepWell’s core philosophies is participating in community events where we can talk with our customers, promote health and wellness, and support causes that are close to our heart. To accomplish this we research events in the Southern California area to determine where and when we can participate. We use several online resources to help with this task and I thought you might be interested to learn how you can find events in your community. There is one site in particular, active.com, that serves as a nationwide database for all sorts of events: from ultra-marathons and 100-mile bike races to fitness expos and 2k dog walks. You can search by city to locate events in your area. In addition to races, active.com also has information on team and individual sports and is an excellent resource for training, nutrition, injury prevention and many other fitness-related topics. Many event promoters use active.com to handle event registration, too. There is also bikeride.com and runningintheusa.com (I think the names speak for themselves). There is some duplication between each of these sites and active.com, but there are several events that are only listed on one site so it’s good to check more than one list. Another good resource is your local parks and recreation department as they typically list city-sponsored events. 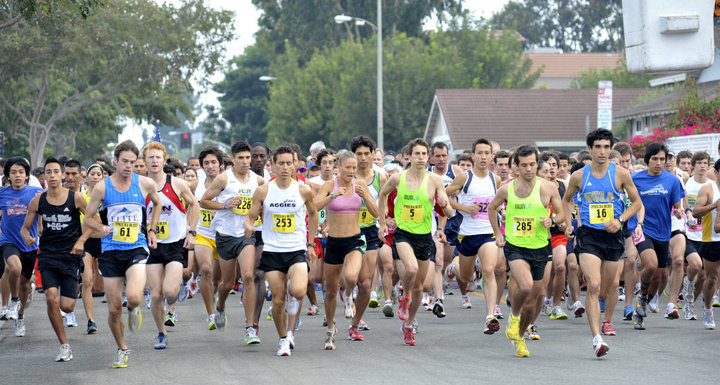 If you’ve never participated in a fitness-related event, don’t be intimidated. While many events are labeled as a “race” you absolutely do not need to compete against anyone other than yourself to reap the benefits. And if a race is very physically demanding, such as 10k trail run for elite runners, the event web site will let you know so you don’t get in over your head. What’s important is that you get out there and exercise. Set a reasonable goal for yourself. For some people, this may be running a half-marathon in under 90 minutes, for others it might be walking a 5k without stopping. We all have to start somewhere. Pick an event that sounds like fun – maybe it’s a bike ride along the coast or a mud run where you get covered in muck. Or support a cause that is meaningful to you. Whatever makes you happy will make it more enjoyable and meeting your goals easier.